These days, it is easy to ridicule the airship. Slow, conspicuous, not exactly built for aerobatics and – worst of all - highly flammable, it has long been considered the albatross of aviation history. Impractical it may have been, but in war the airship proved to be highly efficient at one thing: conveying terror. It was an enemy that, once spotted, grew and grew on approach until it blocked out the light. 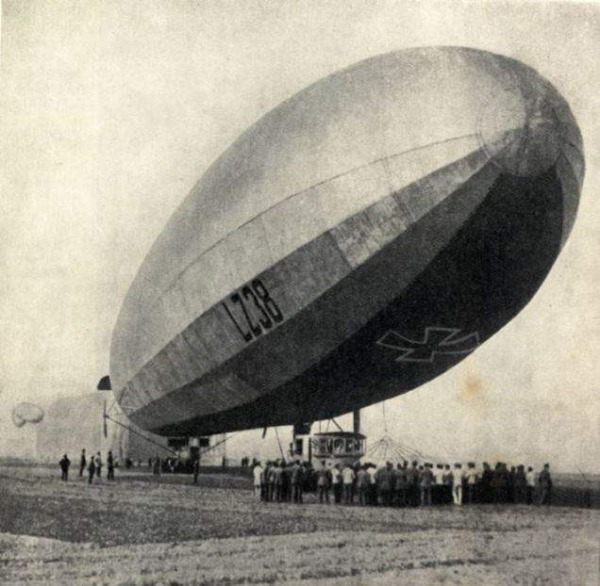 According to ‘The Western Front Companion’ by Mark Adkin, the Germans were way ahead of other European nations in their experiments with airships in 1914, and had built up a considerable fleet of the formidable Zeppelins (named after their creator General Ferdinand Graf von Zeppelin). These had a light but rigid aluminium framework, over which was lain tough fabric, and were filled with hydrogen held in a number of compartments. The engine and two cars hung from the framework, and they were armed with 4-6 machine guns and a collection of bombs. The Zeppelins were about 550 feet long, operated at a height of around 5,000 feet (higher by discharging ballast), and travelled at speeds up to 60mph. 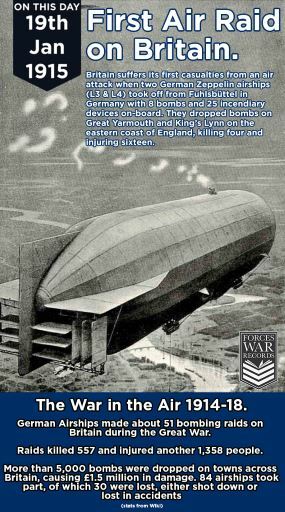 The first Zeppelin raid on Britain, made by 2 airships (L3 and L4) armed with 24 bombs from a base at Fuhlsbuttel, Hamburg, and killed four people in King’s Lynn, Great Yarmouth and Sheringham, and injured 16 others. (A third Zeppelin, L6, had also taken off, but was forced to turn back early after encountering technical problems). The attacks would continue for the rest of the First World War, 54 in all, and by the end of it would have claimed 557 lives and caused 1,358 injuries. Overall, they caused less real damage than the German Gotha bombers, but their psychological impact made up for this deficiency. Each attack caused a great dip in morale, and things got worse with the dawn of the even bigger, even more powerful ‘Super Zeppelin’ at the end of 1916. 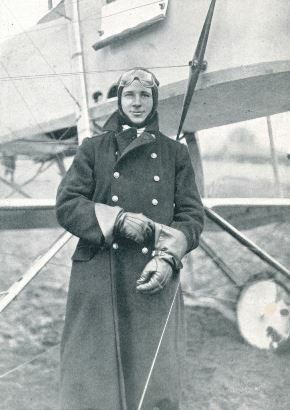 Flight Sub-Lieutenant Warneford received a congratulatory note from King George V himself, conferring the honour, and he was also granted France’s highest gallantry award, the “Légion d’honneur”. He would not, however, have long to enjoy these plaudits. On 17th June 1915 he was killed in an air collision, aged just 23. Meanwhile, nine of the 10-man crew of the Zeppelin were killed. According to ‘The Western Front Companion’ the tenth, Alfred Mühler, survived by a miracle. He was in the front compartment when the smouldering airship crashed through a roof, and shot out onto a conveniently located bed! He apparently opened a pub after the war, and was bought drinks off the back of his incredible story for many a long year.